Forget the debate for a moment on what Google Plus is right now. Let’s assume Google+ has the capacity to do anything, the question is what will it do, and how will users adapt it for their own purposes. Remember when Facebook first launched? No newsfeed. No photos. No search. No finding people more than 3 degrees of separation away from you. No ads. No games. No pages or groups. No grown ups. Forced awkward sentence construction for status updates: “Devon is…going to murder Facebook if they don’t take the damn ‘is’ off of my status update.” And my most-missed feature: “your friend is currently using Facebook at McCarty Hall.” That was a total foursquare premonition. But Facebook, and social media more broadly, has changed dramatically in the intervening 7 years. So let’s play the future history books backwards; what are the likely end-states for Google+ and how did it get there? Masses flee from Facebook to Google+, giving Justin Timberlake a new toy to play with. But it took Facebook 5 years to grow larger than MySpace. 5 years in which MySpace refused to innovate. Facebook has a pretty incredible history of rolling out new & innovative (most often, too innovative) features. In fact, two of their engineers came out with Circle Hack mere days after Google+ launched; there already exists Social Hangouts, a group video chat for 20 people. Feature wars will benefit users, but won’t be a legitimate competitive advantage for either company. Users figure out they share different kinds of content on Google+ (in the way I don’t share Instagram photos on Facebook), or they want to have a different social graph on Google+ (in the way my Foursquare graph is 1/20th the size of my Facebook graph), and everyone lives happily ever after, checking 6 different streams every morning, tailoring every piece of content they create to one specific audience, on one specific network. Early adopters might be destroying this possibility already. 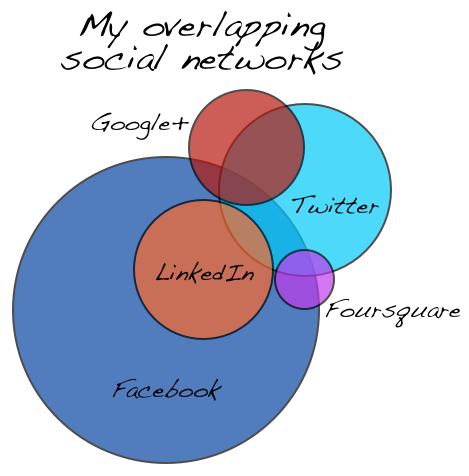 My Google+ circles include more recent weak ties than Facebook (mostly grad school friends & current work colleagues, zilch random people I knew in high school), but the size of my Google+ network has already become nearly as large as Twitter, without Twitter’s 140 character limit. It’s hard to imagine the “team collaboration platform” option staying on the table for long with that kind of growth, but then again Facebook was able to transform itself from .edu to .world. Google+ burns bright and fails fast when it comes out of beta next month. The early adopters will get stuck crossing the chasm with circle fatigue, and never bother to draw the early majority into the network. I think we’ll know by the end of the summer whether this is the case (it took the collective wisdom of the crowds less than 3 months to pan Google Buzz). Google+ finds limited appeal, is adored by the tech elite, and provides just enough use cases to incrementally improve AdWords. In other words, it’s the Gmail of the 21st century. If Google knows you’re you, every time you use one of its many, many products and services, it could significantly improve and expand AdWords. You know, that thing that makes Google 97% of its billions. I’m not yet convinced Google Plus needs to “beat” Facebook, or any other social network, in order to survive. All it has to do is live up to expectations inside of Google to deserve continued resources. Look for AdWords coming to a stream near you. I’m leaning towards future #4. But I recently had to put a few additional thoughts together for an internal discussion at Threespot. Maybe you’ll “like” them?